From its stunning, unobstructed views to the high-efficiency heating that only comes from advanced engineering, the Merit® Pro direct-vent gas fireplace offers the ultimate in style and performance demanded by today's homeowners. Standard features, like ceramic glass and a built-in blower, keep living areas warm and inviting, while optional accessories bring added style to any room. As versatile as it is efficient, the Merit Plus Pro is the choice for affordable comfort without compromise. Highly detailed log set adds character to the hearth. Choice of interior panels provides flexibility to customize the look. Intermittent pilot ignition reduces gas usage and increases reliability. 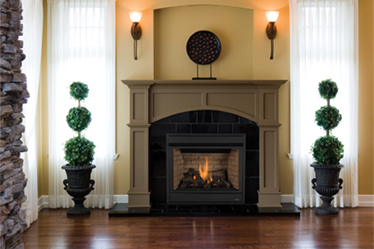 Choice of Style View™ doors and face styles opens up the fireplace to customization. Choose one of two required liners: Rustic Brick panels for a more traditional look, or Gloss Black Porcelain interior panels for a contemporary look.